Seeds are a connection between our past and future. Seeds represent home, culture and survival. Yet, this critical aspect of our planet’s sustainability is threatened by genetically modified seeds and industrialized agriculture. 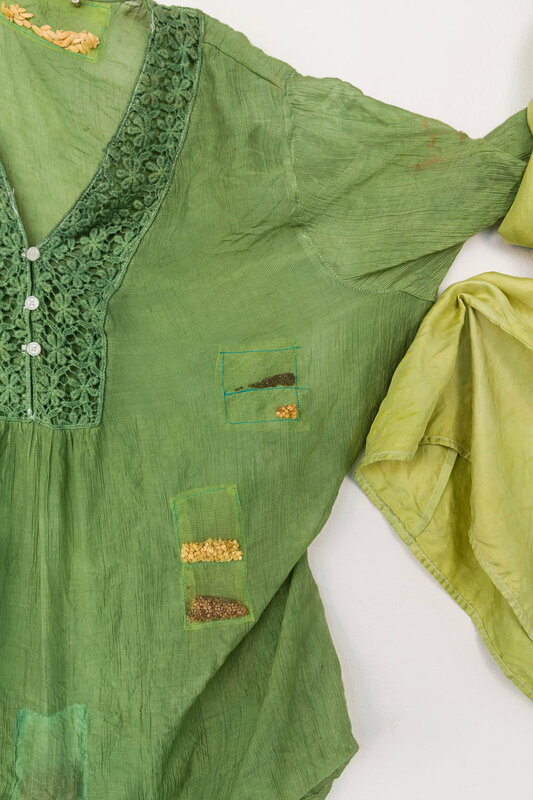 Immigrants, who must often flee with only their most precious possessions, recognize the importance of seeds to their culture and survival and sew them into clothing and luggage to insure their safe passage to new lands. We can thank immigrants for their contribution to biodiversity. By bringing seeds with them, they safeguard the movement of a diversity of seeds from one home to another, facilitating their adaptation to different environments, disease, insect tolerances and climates. Media: clothes, seeds, thread, dye, soft pastel, magnets on the wall.